Change BGP Weight Attribute Cisco router by Route Maps. Weight attribute is used by BGP to break the tie when there are more routes to the same network. Route with the highest weight is preferred. Weight attribute is a Cisco feature, it has local meaning and it is not transmitted to other routers. In this example we will discuss about how to change BGP weight attribute cisco router by Route Maps. As you can see, BGP weight attribute is “0″ for updates received from neighbors. It chose the path over 10.0.1.2 as the best one (marked with “>”), most likely because 10.0.1.2 was the first who advertised the routes received from EAST router. 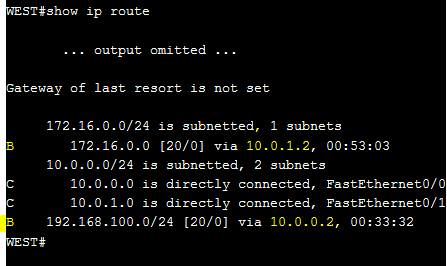 The routes to EAST networks over 10.0.1.2 will be put in routing table by BGP. Further I will change the weight on WEST router in such a manner that packets to 192.168.100.0/24 network will be sent over ISP-1, and packets to 172.16.0.0/24 will be sent over ISP-2 router. Both route maps contain sequence number 10 and 20. Sequence 10 is used to match access lists (route map ISP-1 matches access list 1, ISP-2 matches access list 2). Also in sequence 10 is changed the weight to 100 for those updates matched by corresponding access list. Sequence 20 is empty and is used to avoid implicit deny at the end of route-map, ie, to keep updates unmatched by access list. And that’s all! Because we changed local router policies we need to make router to generate new inbound updates from stored table. That’s it, with route maps also can be changed the weight for updates generated from a specific AS by using as-path access lists and match as-path route-map statement. Thanks for reading!